Editor’s Note: This is the first interview in a new conversation series by curator Dina Deitsch. Art Journal Open asked Deitsch to select three artists from three different exhibitions she curated during her tenure at the deCordova Sculpture Park and Museum, and discuss with each artist the process of creating work for the exhibition, as well as the exhibition’s aftereffects for both the curator and the artist. First up: artist William Lamson and his video Untitled (Walden) which is currently on view in Walden, revisited. In late 2014, I organized the group exhibition Walden, revisited at deCordova Sculpture Park and Museum, a contemporary art museum in Lincoln, Massachusetts, located just two miles from the pond made famous by Henry David Thoreau. The exhibition remains on view until April 26, 2015. 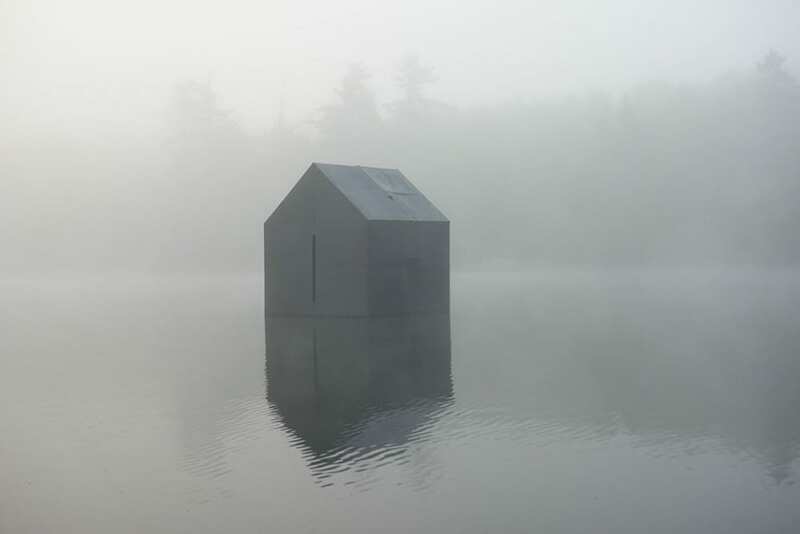 One of the fifteen projects featured in the show is a new video by William Lamson, Untitled (Walden), a poetic re-envisioning of the book’s iconic cabin and watery landscape. 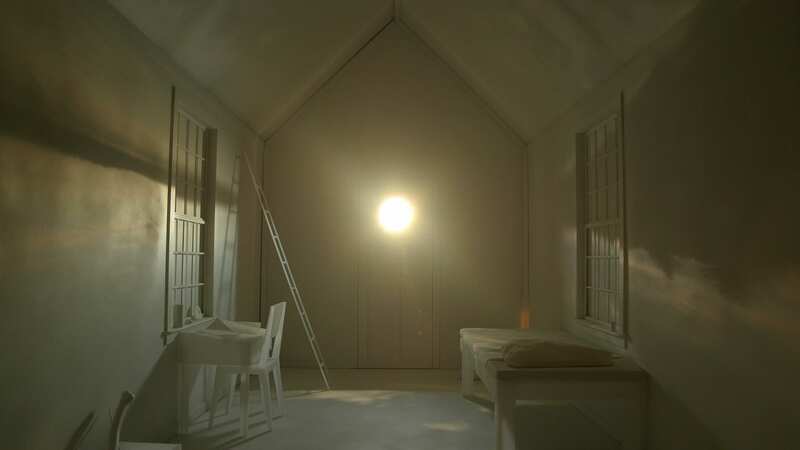 To create the video, Lamson built a small-scale model of Thoreau’s cabin reimagined as an artist studio entirely in white, furnished (without historical accuracy) with a desk, ladder, and bed. 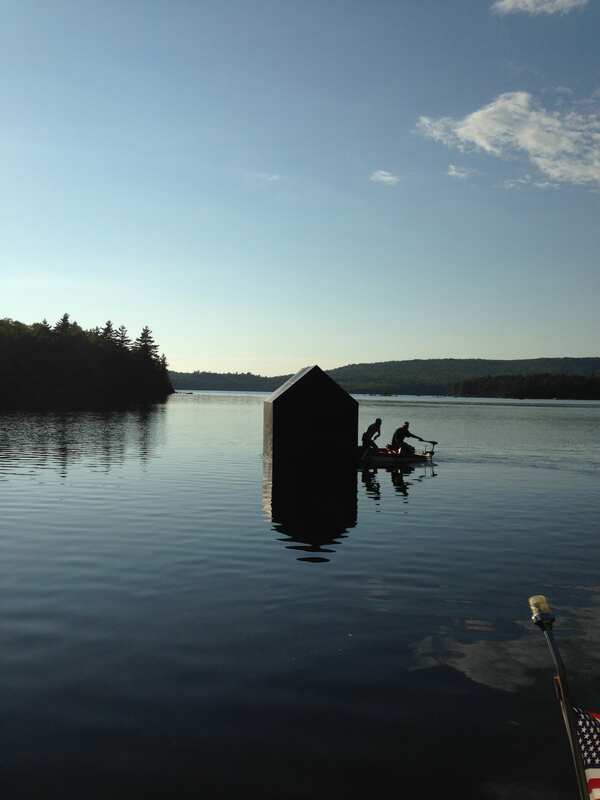 The model was floated on a lake within an eight-by-eight foot cabin-shaped tent which functioned as a camera obscura. 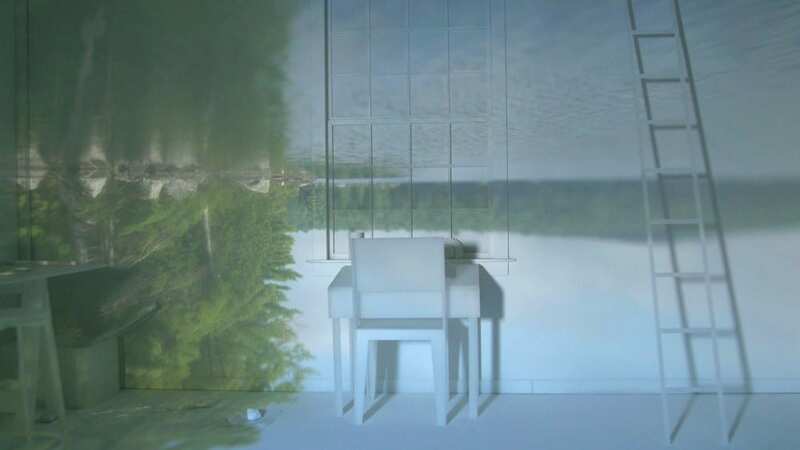 The resulting video captures the projected image of the inverted lake landscape as it moves slowly over the interior of the model cabin, illuminating the walls, furniture, and tools within this constructed space. In the American cultural consciousness Walden Pond has become an idea more than a place as a result of Thoreau’s naturalist and philosophical writings. Walden, published in 1854, details his deliberate escape into the woods to live a life simplified to “only the essential facts” in the now-iconic, self-built, one-room cabin on the shores of the pond. The book infused nature writing with the philosophical underpinnings of Transcendentalism, exalting self-reliance and direct experience of nature as the very marrow of existence. From the 1930s onward, Walden has been firmly ensconced within the canon of great American literature. Its message of living simply, economically, and intentionally has resonated throughout subsequent generations, from the 1960s back-to-the-land movement to the land conservationists of the 1970s to today’s DIY movement. Walden, revisited set out to examine the complicated and evolving legacy of the book against Walden Pond’s current landscape, today a state park and popular swimming hole. Each project in the exhibition mines the fertile territory between real and idealized space, between distinctive historical moments of Thoreau’s writing and today, and the ever-widening gap between nature and culture so narrowly depicted in Walden. In many ways, Lamson’s video exemplifies the very task of this curatorial project of translation and mediation. Over the past decade, Lamson has created a series of outdoor, performance-driven video works that infuse a bit of Roman Signer’s DIY humor within the sublime landscape tradition rooted in the Hudson River School and the Earth artists. In his videos and related photographs and objects, Lamson harnesses natural elements of wind and sun, and with an enormous amount of ingenuity he creates surprisingly new depictions of the natural landscape. Dina Deitsch: Knowing your work in video and your overarching interest in landscape as a subject matter throughout the history of photography, I immediately thought of you when I was working on Walden, revisited, and looking for artists who address the legacy of Thoreau’s tome. So much of what we think about when we think about Walden is its deep, unmediated connection to nature. Untitled (Walden) plays with that idea heavily by transforming the iconic single-room cabin into a camera apparatus. William Lamson: When I reread Walden in preparation for putting forward a proposal, I was taken by his physical descriptions of nature. In relation to these specific, almost photographic descriptions, I began to think of the cabin itself as a device for seeing. Since the basic elements of a camera are a box with an aperture, and the camera obscura the most basic iteration of that model, it felt appropriate that he was living within an architecturally equivalent space. Given this relationship between the one-room cabin and a camera, my first thought was to move Thoreau’s re-created cabin, which currently sits a few hundred yards away from the pond, onto a raft and turn his space into a camera obscura. I should explain that a camera obscura is just a light-tight room with a single aperture to the outside world. In a camera obscura, the optical effect that happens is that an upside down and backwards image of what is outside of the room is projected on the wall opposite the aperture. This effect can happen with just a small hole, but the image is sharper if a lens is used. My initial ideawas that viewers could be shuttled out to this floating cabin, sit in the darkened space, and observe the landscape projected on its interior. What was exciting about this idea was that it pushed the familiar camera obscura phenomenon closer toward a directed cinematic experience, as the subtle drifting movement of the raft on water would create a constantly shifting image inside the cabin. I don’t think I told you this idea because it was totally impossible, but I soon realized that a similar experience could be created using a model instead of the actual cabin, and creating a video of the moving image inside the model instead of making it a real-time experience for viewers. In the actual installation of the video at the deCordova, viewers walk into a darkened space where the video is projected across the entire back wall of the gallery, which at times creates the illusion that we are looking through the wall and into the one-room cabin. Although this is certainly a different experience than if we had shuttled viewers out to a raft on Walden Pond, the video creates a compression of time, space, and multiple perspectives of the landscape all within the eighteen minute duration of the piece. I believe this is a much more layered experience than just the camera obscura phenomena itself. Deitsch: I do appreciate that you didn’t share that—I can only imagine trying to troubleshoot it! This brings up a great point about the viewer experience and function of the camera in the video. In your past work, it seems that the filming structure was primarily documentary, in that you set up an action or performance (often featuring you) and filmed it with a somewhat straight aesthetic: minimal camera movement, basic editing, etc. In this video you’ve devised not just an action but an entire spatial experience for the camera and viewer. Can you describe this shift in the operation of the camera and in your thinking about video or performance? Lamson: In some ways the shift can be summarized as a move from performing in front of the camera to performing inside of the image-making system itself. However, there are a few important similarities to the methodology of previous projects that I think are important to point out. In A Line Describing the Sun (2010), a two-channel video, I follow the sun with a Fresnel lens melting the desert floor into a line of black glass, what may feel like a relatively straight forward document of a single performance is actually a highly constructed video work that involved me performing this event over five days. By staging this gesture over and over, I could shoot the project myself with one assistant, exploring different aspects of it each day. 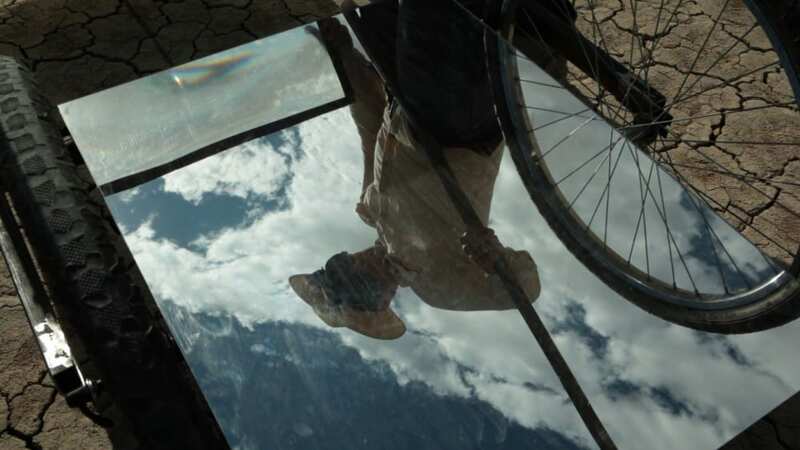 A major component of this piece was the construction of long tracking shots that vary from a high-angle, wide-shot pushing into the landscape, to macro images of the melting earth viewed through welding goggles. These technical shots are critical to representing the shifting scales in which the work can be perceived: a solitary figure drawing a black line into the landscape based on the movement and rotation of the Earth relative to the Sun, and the alchemical process in which earth is transformed into black glass. All of these tracking shots contribute to the feeling of constant motion that is central to this piece. The production of Untitled (Walden) was actually quite similar to A Line Describing the Sun, in that I worked with one assistant, and each day we would conduct the same basic action: take the floating camera obscura out on the lake at dawn and record the projected image of the landscape on the interior surfaces of the model cabin, looking for new ways to document this phenomena. The major shift in thinking came from the fact that each shot actually involved operating two cameras, and using the focus, framing, and orientation of each to create a single image. Further complicating this process is the fact that the floating camera obscura is naturally both a camera and a dolly. Untethered, it was free to move effortlessly with the slightest breeze, creating pushes, pans, and tracking shots entirely by itself. The floating camera obscura is therefore a preexisting cinematic space that I could physically enter but which I could not totally control. Deitsch: In many ways the role of the landscape in this video is not just as a subject but a collaborator—in that you forfeit the control of the camera’s movement and the light conditions to this pond. Whereas the space in Untitled (Walden) may appear more overtly fictive and constructed than your previous videos, the role of the landscape seems to be more deeply ingrained. Has your thinking about landscape or nature shifted at all as subject matter? Lamson: The landscape operates as both the subject matter and a set of changing physical parameters that affect how I respond to it. In that sense my thinking has not changed from previous works where this sensitivity to the environmental conditions is critical to how the performative action unfolds and how the video work eventually comes together. Yet, because the “action” of this piece is largely determined by the cinematic movement of the floating house and the natural phenomenon that is happening outside in real time, the work becomes much more about seeing and the act of looking than any of my previous projects. While shooting this video I had the experience of watching the highly constructed, colorless interior suddenly disappear as my attention shifted to something moving in the projected image of the landscape. In other moments, as direct sunlight enters the room, it is the image of the landscape that vanishes, washed out by a flood of yellow light. It is this tension between the deep virtual space of the projected image and the finite space of the room that I found really exciting to work with. Deitsch: As a projected image in the gallery, the final video compounds this spatial confusion even further. At certain points the white gallery becomes an extension of the white cabin model, effectively transporting the viewers into this fictive (and tiny) space. I was struck by how much this experience resonates with the act of reading, with falling deeply into a place described in a book, which is exactly how many readers relate to Walden. Yet it’s not just the immersive quality that echoes its literary source, but the way in which space is so slippery and wonderfully nonspecific, similar to how space can be in writing (even in a book as precise as Walden). Can you describe this slippery or overlapping fictive space you’ve created in this video? Lamson: A technical description of the apparatus itself can help explain the relationship between architecture, the camera, and the strange space created in this video. There are really two viewing spaces—one determined by where the camera obscura lens is inserted into the wall of the floating cabin and the second where my video camera frames the model cabin on which the projected image of the landscape rests. Since each shot required the framing and focusing of two lenses, the result is a kind of collision between two simultaneous viewpoints. 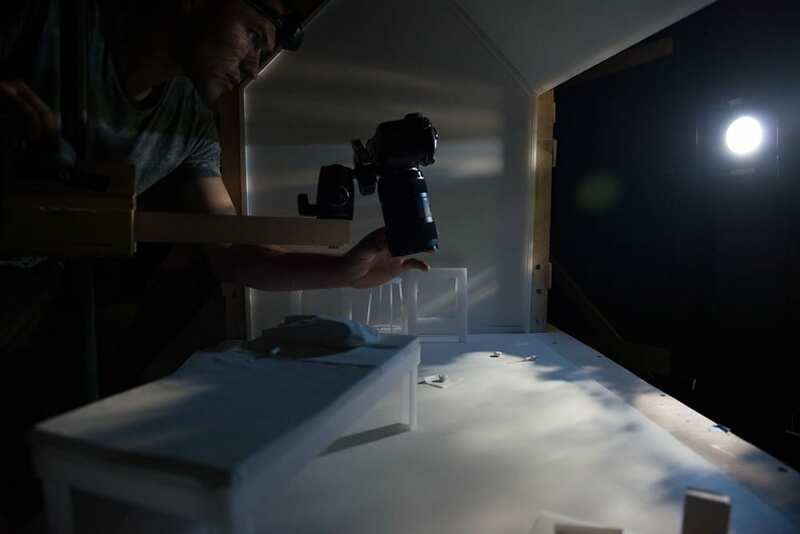 In one instance we removed the miniature model’s roof so that within the architectural space, the video camera looks directly down on the model’s floor while the image projected on this surface is that of the sky. These contradictory perspectives are held at the same time and create a strange sensation as you try to orient yourself. It is in these moments, when viewers are recalibrating where they are and what they are looking at, that the interior momentarily disappears as they try to figure out the perspective. Deitsch: You create a situation where the viewer is in two places at once. The video gives us that impossible view. Lamson: Yes, but the video begins with a more familiar perspective. Despite being upside down, the landscape is projected on relatively flat surfaces followed by a three-minute tracking shot of the entire lake which eventually brings us right up to shore, appearing as an unfocused, shadowy abstraction. In this way, the piece is structured to go back and forth between shots that are quite discernible and ones that are more abstract. Deitsch: Untitled (Walden) in many ways creates a landscape of the mind. While deeply ‘Thoreauvian,’ it resonates with your 2012 sculptural work, Solarium. 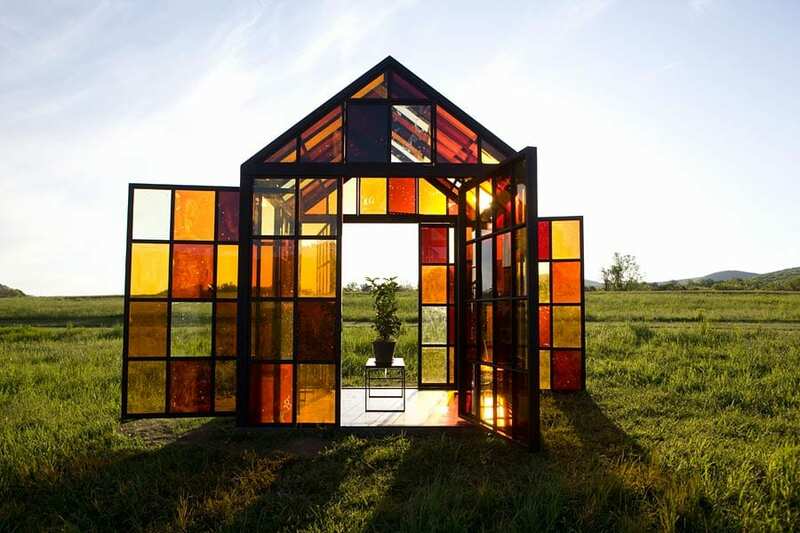 It is a caramelized glass house you made by cooking sugar to different temperatures which resulted in a spectrum of reddish-yellow glass panels. Visitors entered and experienced the outside world through varying golden-brown tones of the window panes. Like the video, this was an architectural framework through which one could view or re-view the landscape. At one point we even talked about bringing it into Walden, revisited for its cabin reference, but there would have been assembly issues and the video proposal won out. Do you see these two projects as contiguous with one another? Is there a certain will to dissolve architecture at play here or, rather, the need to be inside the camera apparatus? Lamson: The projects are related in that each functions as an experimental framework that mediates the viewer’s experience of the landscape. In Solarium, the piece itself was a functional greenhouse in which we grew three species of citrus trees. I was interested in how the red-yellow light coming through the caramelized panels would affect the plants themselves, and if they would one day bear fruit. This possibility suggested a recursive materiality at play between the color of the light and the color of the fruit that the trees might produce. Inside the house, each window panel created a colorized frame through which to see the landscape. The work allows for a shifting experience between the unique color and texture of panels themselves as they age and change in the sun, and the landscape that is visible through it. This shifting focus is the same kind of experience created in Untitled (Walden) between the deep, projected space of the landscape and the shallow space of the model cabin. In both cases, the work brings the viewer into an architectural space constructed to provide an optical experience. Deitsch: In a way, architecture becomes an extension of the body: the viewing body. And speaking of viewers, Solarium was commissioned by Storm King Art Center for its 2012 group exhibition Light and Landscape. 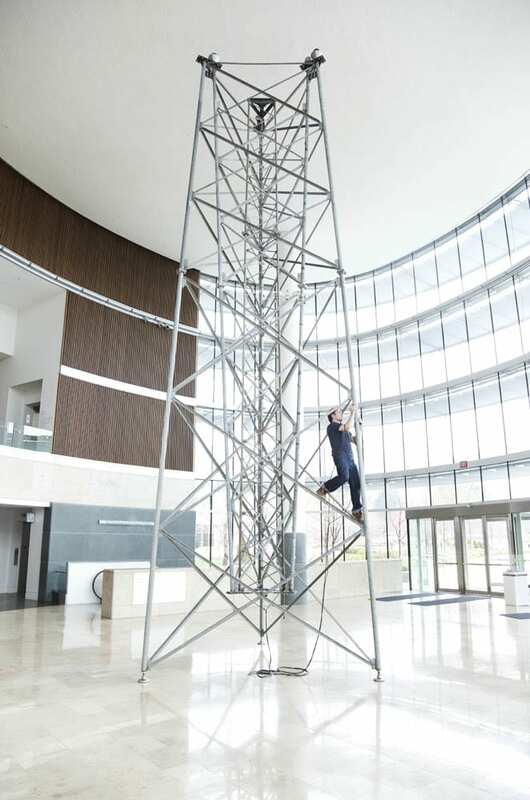 It seems that a lot of your work starts this way—by invitation from a museum or organization, whether it’s deCordova, Storm King, or the Indianapolis Museum of Art, where you created a large-scale sculptural installation that includes an old radio tower, Divining Meteorology (2011). Lamson: Over the last few years, I have been fortunate to have a number of opportunities to make work for a specific space or idea, and this process is really generative for me. It’s like an assignment but it’s also a chance to work through ideas that I have had kicking around, just as you and I talked through different proposals. In general, I don’t make very many projects a year because it takes a while to develop an idea, and then it takes even longer to figure out the mechanics of how to actually do the project. Then the reality of having a deadline becomes this great force of clarity, because it usually puts me in a position where I have to drop everything else and just focus on this one project. Despite the anxiety, I love working this way. Deitsch: In each of these projects there’s an enormous number of logistic hurdles, such as how to film a floating cabin, convert a tower into an instrument, or create a caramelized greenhouse. Each sets up metaphorical or even metaphysical questions or situations that you answer with incredible ingenuity. It’s as if you invent new machinery and techniques of execution for each project. Is it important for you to come up with new systems and new contraptions with each work? Lamson: It must be important because it seems to keep happening! In almost all of my projects I often need to build not only the apparatus or the prop for the action which appears on camera, but I also have to make the set of tools for filming the action as well. For example in Untitled (Walden), not only did I need to make a model of Thoreau’s cabin and all the objects inside, but I also had to build the full-size, floating camera obscura in which I would shoot the model, and a rolling camera stand with an arm that would fit between the wall of the camera obscura and the model. These things needed to be constructed in a way that I could still fit them in my station wagon and drive to the lake in Maine where we shot the video. Despite these significant logistical challenges, I have learned that there is a real benefit to working this way. Since I build the props and tools, and operate the camera myself, it means that when we finally shoot the video, I know how everything works, I can budget many days for shooting because I don’t need more than one or two assistants, and I can use this time almost like being in the studio. I try things, and then I try something else. I observe what is happening within the system I created and I stay open to the natural conditions that are presented to me each day. Deitsch: In this, you really merge video and sculpture practices together on a deep, structural level. Lamson: They are inherently linked in my work because the physical objects are often functional elements in the production of the work. 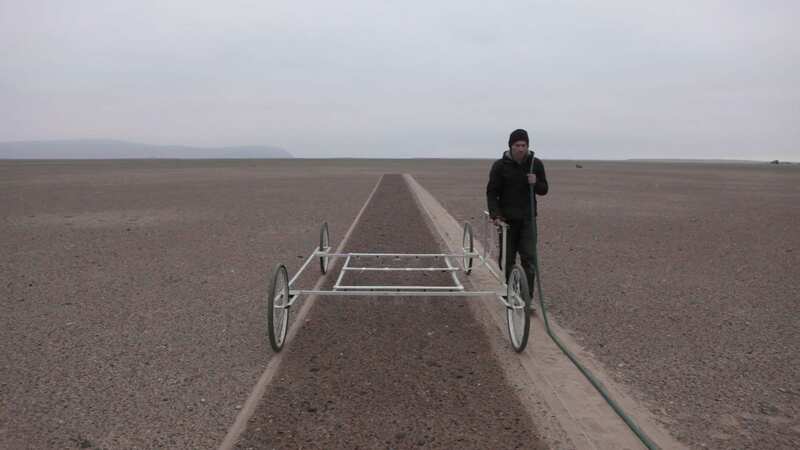 In Hydrologies, a 2014 project that involved selectively irrigating linear sections of the Atacama Desert in the hopes of activating dormant seeds and creating a line of flowers, the irrigation rig that I pushed back and forth across the landscape was essentially a dolly. We used it as one for a number of shots. I like this idea of hybridity: that objects can have multiple uses and be transformed from one function to another. This concept was essentially what motivated Divining Meteorology, how a defunct communications tower that had been lying in a field outside of St. Louis could be reanimated as an instrument that still retained something of its prior life. Deitsch: So in the end, perhaps you’re a poetic pragmatist? Or, dare we say, Thoreauvian? Lamson: Perhaps, but I doubt Thoreau would agree. Dina Deitsch is Director of Curatorial Projects for GoodmanTaft, where she oversees artist commissions and publications, and faculty at Massachusetts College of Art and Design and the School of the Museum of Fine Arts, Boston. She was curator of contemporary art at deCordova Sculpture Park and Museum in Lincoln, Massachusetts, from 2008–2014, where she organized Walden, revisited among numerous other projects. She received her BA from Yeshiva University, MA from Williams College, and MPhil from the Institute of Fine Arts at NYU. 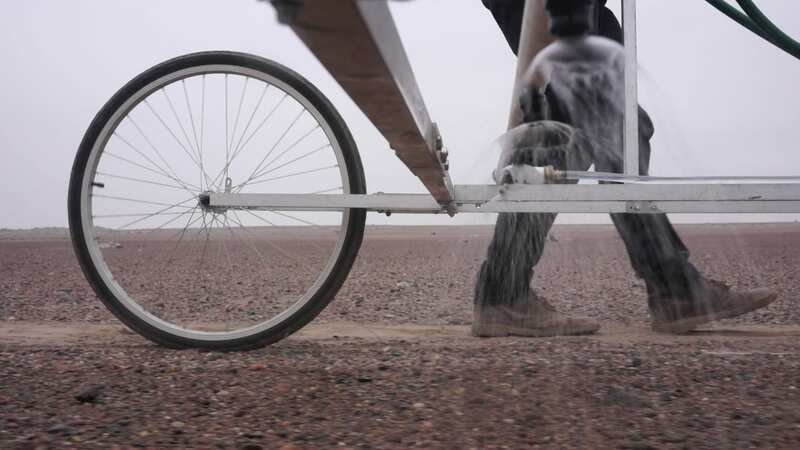 William Lamson is an interdisciplinary artist whose diverse practice involves working with elemental forces to create durational performative actions. His video works often find him playfully and strenuously interacting with his environment (both in the natural world and in his studio). Lamson’s work has been exhibited widely in the United States and Europe, including at Utah Museum of Contemporary Art; Brooklyn Museum; Moscow Biennial; MoMA PS 1; Museum of Contemporary Art, Denver; and Honor Fraser Gallery in Los Angeles. In addition he has produced site-specific installations for the Indianapolis Museum of Art, The Center for Land Use Interpretation, and Storm King Art Center. His work is in the collections of the Brooklyn Museum, Dallas Museum of Art, Indianapolis Museum of Art, Museum of Fine Arts in Houston, and a number of private collections. He has been awarded grants from the Shifting Foundation and the Experimental Television Center, and is a MacDowell Fellow. His work has appeared in ArtForum, Frieze, New York Times, Los Angeles Times, New Yorker, Harpers, and Village Voice. In 2014, Lamson was a recipient of a Guggenheim Fellowship. Lamson was born Arlington, Virginia in 1977 and lives in Brooklyn, New York. He earned his MFA from Bard College, and he teaches in the MFA photography program of Parsons The New School for Design.